Rob Cohen, director of The Mummy : Tomb of the Dragon Emperor has posted another update on his blog. Here is a first look of Jet Li as Emperor Qin Shi Huang during there shoot in Tianmo, China. "Today, I shot Jet Li on his black stallion riding into battle in his jade armor. He looked nothing short of an Emperor. He has been totally professional and warm to me and the entire crew, like the prince he truly is." 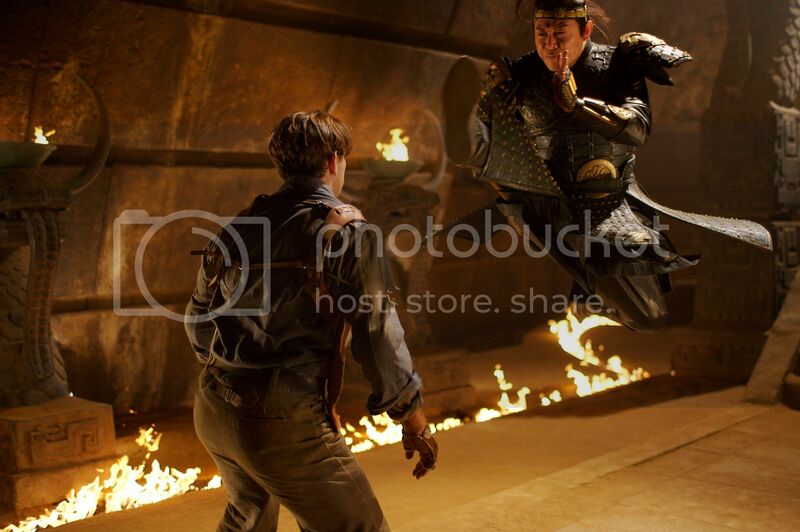 Here's some flavor of the mano a mano Brendan Fraser/Jet Li fight. Out here in Tianmo, there is no internet (there is no indoor plumbing!) so it takes some time in ‘dial-up’ back at the hotel. Be patient. I am trying to serve you up something special next July 30th, which takes the other 23 ½ hours a day! He also mentioned on his blog that he is glad that he started an online journal because he got the chance to read some insights from movie fans especially from The Mummy aficionados. The fan's suggestions and comments became important contributions to the production of the film. That is why he is confident that this movie will sure be a big hit.